Transit Police report they have obtained a search warrant for the arrest of Rogelio Alvarado, 21, for last week's double shooting at the Maverick Blue Line station. Alvarado faces charges of armed assault with intent to murder and assault and battery with a dangerous weapon, as well as a number of firearms violations, police say. Read more. Maverick Square. Photo by Justin Perricone. UPDATE, 4:19 p.m. The Blue Line has resumed service through Maverick and Maverick Square has been re-opened to traffic. Maverick Square is shut down as Transit and Boston Police investigate a double shooting inside the Blue Line station around 2:30 p.m.
One witness reports it happened on a train. Buses are running instead of the Blue Line between Bowdoin and Airport. Congress Street downtown was shut between State and Washington due to congestion caused by all the buses. The Dig reports on the residents of 173-177 Maverick St., whose new landlord upped their rent, did nothing when the water stopped and now has stopped paying for alternate housing for them after a rear wall collapsed. Around 10:10 p.m. on Sumner Street near London - although the victim was found on Border. Workers getting off the last train at Maverick could have a place to get some tacos if the Boston Licensing Board approves a 2 a.m. closing time for Taqueria Cancun, 192 1/2 Sumner St. But if the board votes Thursday to extend the restaurant's closing time from the current 11:30 p.m., owner Jose Torres will have issues with landlady Maria Salgado, who attended the board's hearing this morning with a lawyer to voice her opposition because of the potential impact on the residential tenants in the two floors above the restaurant. Read more. 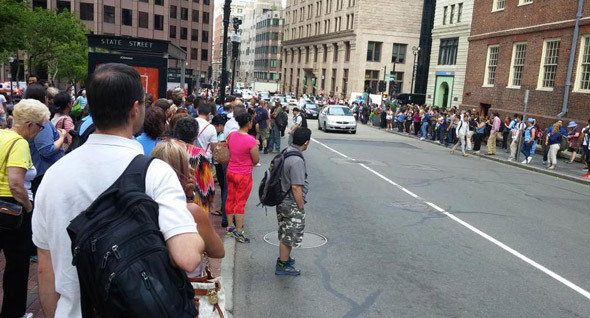 T workers turn into Waldo at State Street: Where are they? Photo by Mister AO. The T says it's busing passengers between Bowdoin and Airport - except Bowdoin riders are supposed to catch the bus at Government Center - due to a bomb threat that shut Maverick station around 5:30 p.m.
Update: Around 6:48 p.m., Transit Police completed their sweep of the station and re-opened it for service. 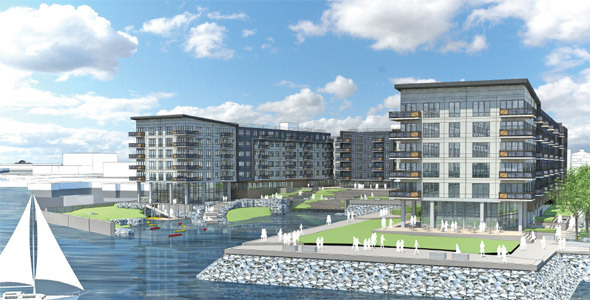 The BRA today approved a 492-unit apartment and condo project at Clippership Wharf in East Boston - some 25 years after the first proposal for the long vacant 12-acre parcel. Read more. 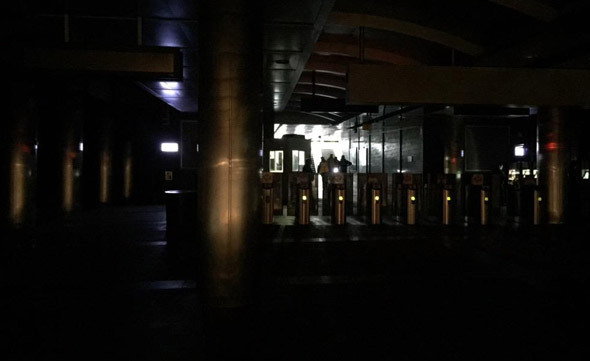 Alex Jafarzadeh shows us a darkened Maverick station on the Blue Line around 6 p.m.; reports trains were still running despite the lack of light. 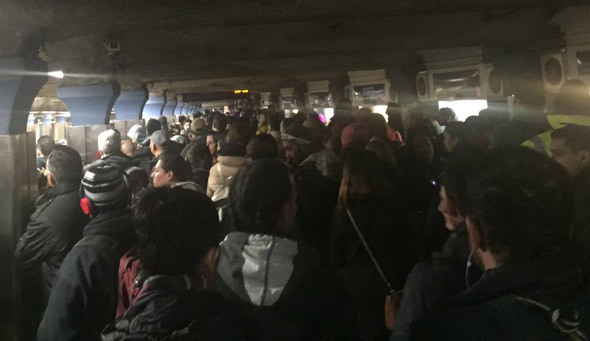 Shortly after 5 p.m., riders began reporting issues on the other side of the harbor on the Blue Line. The E Line, meanwhile, got shut between Northeastern and Heath due to a power problem. Transit Police report an inpsector at the Maverick Square Blue Line jumped into action yesterday morning when he heard a passenger's cries for help - and prevented her alleged purse snatcher from leaving the station. According to police, the woman, 66, was on an outbound Blue Line train, her purse next to her, around 9 a.m. When the train pulled into Maverick. David Smith, 28, of Winthrop, "forcefully grabbed" her purse and ran off the train. A concerned citizen complains about the rush somebody appears to have been in to dispose of a Christmas tree at Havre and Maverick streets in East Boston. Allen Morrison posted a copy of 16-mm footage of trolleys running from Maverick to Suffolk Downs in 1949. The Boston Business Journal reports the BRA last night approved a 16-story replacement for an old 9-story industrial building on New Street, next to LoPresti Park. A Portland developer who recently bought the nearly 4-acre parcel will give the BRA $7.8 million to build affordable housing somewhere else; the BRA approved that after the developer said the project would be financially unviable if it had to incorporate affordable units into the project. Around 10:15 p.m. Police are looking for a Hispanic man in his 20s with black hair and a ponytail who showed a knife. Stanley Staco reports a man was shot around 11:20 p.m. on Sunday at London and Sumner streets. Boston Police report arresting two teens and a Cambridge man on charges of disturbing the peace at 3 a.m. today outside 63 Maverick St.
One of the teens, 17, was also charged with illegal possession of a loaded FIE Corp Titanic .32 Long Caliber gun found when the three ran away from arriving officers, police say. An East Boston couple were arraigned on assault and battery and robbery charges yesterday after they allegedly beat a cabbie who wouldn't step on it to get them to a doctor's appointment on the other side of the harbor, according to the Suffolk County District Attorney's office. Some sort of witchcraft nobody ever die there yet it's a cemetery plot.